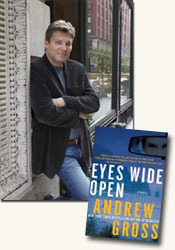 Bestselling author Andrew Gross has had tremendous success both co-writing novels with James Patterson, like Judge &Jury , Lifeguard , 3rd Degree , The Jester , and Second Chance , and authoring thrilling novels of his own, like The Blue Zone , Don't Look Twice , Reckless , and The Dark Tide . He graciously agreed to do an interview for curledup.com discussing his latest thriller, Eyes Wide Open , and what it was like working with James Patterson. Interviewer Douglas R. Cobb: What it's like co-authoring a novel with James Patterson. Besides Patterson, which authors and books have been a major influence on you? What authors currently writing do you enjoy reading? Andrew Gross: If Patterson's individual books haven't had the strongest effect on me, working with him, and the degree to which I have incorporated what I learned there into my own style, has. Most of the key influences on me tend to be more literary: Dog Soldiers by Robert Stone, All the King’s Men , Blood Meridian by Cormac McCarthy. I try to keep up with Harlan Coben, Lee Child, Linwood Barkeley, Greg Hurwitz, occasionally Daniel Silva, although we're on a different side of the field. How was it that you originally met James Patterson and got the opportunity to work with him? Did you work with him always in person or by corresponding with him electronically? Do you think you might like to co-author a book with James or anyone else in the future? Jim found me, actually, and though it's too long a story, it basically changed my writing life. I had left a kind of lucrative career to write a political conspiracy novel, and when it ultimately failed to connect, I was sitting around in my den not knowing what my next step n life was, when someone called up and said, "Can you take a call from James Patterson?" I paused the requisite few seconds, my jaw dropping and uttered, "Yes." Apparently my rejected manuscript had been given to him by the head of his publishing house praising my development of female characters, and he was contemplating putting four women crime solvers in a new series and felt he needed help. We teamed up and the first book went straight to #1. Did five more!!! At the same time, it was right to move on when I did, and while I don’t foresee plans to reconnect with Jim, I am open to my own co-writer when my publisher starts paying me $5-8 million a book! Eyes Wide Open is in part based upon the tragic death of your teenage nephew, Alex, and a chance encounter you had as a teenager with cult leader and killer Charles Manson. In my advance copy of the novel, that the inner right hand pages show the title as Eye Wide Open. Was the original title Eye Wide Open? I’m curious about this and the reasoning behind the title choice. Never noticed that. Good eye! Just a formatting mistake. It was actually titled by my editor, after some back and forth. (And duress!) My working titles always seem to get rejected. Same on the next one too. The short chapters of Eyes Wide Open and James Patterson novels in general help make the action and suspense more intense and move the plot along faster. Are the short chapters one of the ways James Patterson influenced your writing style, or did you write this way prior to having worked with him? I learned a lot from Jim stylistically that I try to adopt into my own work. While I don't keep up with his newer books and some of his stuff is not my style, as an innovator he's brilliant. My chapters aren't as short as Jim’s, but I am a strong believer that structurally, this kind of quick cinemagraphic scene- shuffling is an engine that keeps books moving. Not to mention setting books in first-person POV, but shuffling them with 3rd-person chapters on victims and the bad guys, so that the reader can be in their heads as well. This kind of telescopic point of view really makes the reader FEEL what is going on, a big element with him. Do you know about the medications you write about because they were ones your nephew had to take, or through additional research you did? Just having been there and part of their lives. Kind of the ground floor of research when it comes to writers. Is Lenny Erlich, Jay and Charlie's father, anything at all like your own? Yes, he is. In fact, much of what is in the book is drawn from anecdotes and lore from my own family. My dad was a charismatic, over the top, probably bipolar but no one knew it then, garment promoter and raconteur and quite the ladies man. Went out with many known starlets in Hollywood. But ultimately died lonely, broke and leaving a wake of failed lives around him. Good material for a book! Part I of Eyes Wide Open is one of the most emotionally raw and intense openings of a novel I've ever read. I could feel the sadness and grief you felt at the death of your nephew, through the death of Dr. Jay Erlich's nephew, Evan. Is Erlich's quest for the truth, which leads him to getting interviewed on television by a news reporter eventually, similar to how you felt at the death of your nephew? Thank you for that. What better goal of fiction is there other than to feel someone else's human dilemma. Even crime fiction. But the truth is, I had a distant relationship with my nephew and while much of it in the book reflects actual situations, I'd be dishonest to say I was left empty by his death. In that way, I think Jay's ambivalent feelings, which grow in intensity as he digs for the truth, is pretty accurate of mine. The way Jay met Houvnanian was at his father's house. Houvanian was with Jay's brother, Charlie, trying to get money from their wealthy father to produce a record. Did you meet Manson under similar circumstances? The scene in the book was pretty much the way it took place. Still, a very chilling experience that still comes back, forty years later. Did you get to tour Pelican Bay? You describe it from the vantage of being in a helicopter, descending towards it, and then you mention many details about its interior - or does your knowledge come from your research instead of firsthand knowledge? Research. I've written about it in two books. Jay Erlich’s meeting with Russell Houvnanian at Pelican Bay is chilling, and Jay feels that Houvnanian is taunting him. Did you every get to interview Manson there, or is your realistic and chilling portrayal of Jay's interview with him taken from how Manson has acted with people in other interviews you've read about? I had read Helter Skelter years ago. I didn't try to make him a Manson clone. Just the smartest and most evil person in the room. Why does Susan Pollack, one of Houvnanian's followers, mail him the lyrics to the Guns N' Roses song "Estranged"? I'll leave that one to find out in the book. Always working on as new one. In fact, just turned it in. It's called Fifteen Seconds and retells the story of something that happened to me while on book tour a year ago in Houston, where I got pulled out of a car after a minor traffic violation, cuffed, told I was being arrested and taken to jail, thrown in the back of a police car, and pummeled with very chillingly 9/11-type questions. In my case, the situation ended benignly. Not so for the character in my book, or the arresting officer. Thank you once again for the interview! We all wish you much luck, happiness, and success in the coming years. Andrew Gross is the author of The New York Times and international bestsellers The Blue Zone and The Dark Tide, and coauthor of five No. 1 bestselling novels with James Patterson, including Judge & Jury, Lifeguard, and The Jester. Contributor Douglas R. Cobb interviewed author Andrew Gross, author of Eyes Wide Open (see accompanying review), about his book for curledup.com. Douglas R. Cobb/2011.